What Would Mike Do? : The hotel blog: Do hotels give out the most undesirable rooms at check-in by default? If so, why? 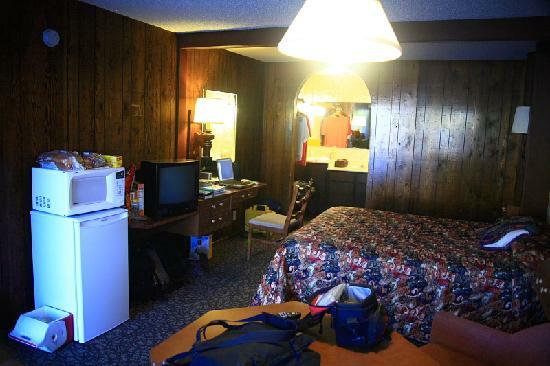 Do hotels give out the most undesirable rooms at check-in by default? If so, why? It happens but I wouldn't say it's something that happens altogether 'by default'. See Michael Forrest Jones's answer to How do hotels assign rooms. First of all, undesirable rooms are tricky to sell, at least to other than undesirable guests. We want the room to be fresh, clean, comfortable, everything in it in good condition and working; because we want you to like us, and like our hotel, and we want you come back (and if for no better reason than we don't like to hear you complain). I take it that you mean undesirable as 'less to be desired than other rooms of generally equal size, furnishings and amenities' (say, because of not much of a view, or at the end of a long hallway, or it's because it's too close to an elevator or a vending area and you have to put up with the noise from that), a few of which will be present in any hotel. Also, keep in mind that in a well-maintained property, there won't be too much variation in the quality of the rooms - if any at all is noticeable. Some will have more space or amenities and will sell at a higher price. Some will be due for remodeling, if the hotel is large enough that remodeling is done in stages (e.g., they do one floor every couple of years, so that over a ten-year period, the rooms on all five floors get done and it's time to repeat the cycle) and where such a state of affairs is present, what I might do is price those rooms a little lower. But even then, the variation in quality isn't going to be that much: you shouldn't even notice it. As a practical matter, it can't be. Too many guests that come in are not shy at all about wanting the best room in the house at a discount off what the guy in the cheapest room is paying. That said (and let's all repeat this mantra again one more time, for those new to our viewing audience: all together now . . . "Every hotel makes its own rules . . ."), if anything, we want most every guest to have the best room that we can give him or her for the money that he or she is paying. On a slow night, you'll get one of the better rooms (if you're among the first to arrive after we've set aside, 'plugged', rooms for incoming reservations) if there's any noticeable variation at all in rooms we sell at your price. On a night when we're busy and the hotel is expected to be full, you'll have to take what's left. If you have an advance reservation and I know you're coming, I'll try to plug you into a good one, in advance (again, this assumes a hotel where the rooms offered at the same price vary that much in quality . . .) If you're a regular customer and I know what you like, I'll try extra hard to accommodate that. You're risky. If we feel we're taking a chance renting to you because of the housekeeping or damage problems you might leave behind (whether because of intoxication, you're part of a rowdy group, or you've got the wife and a bunch of hyper kids with you), you're getting a room not likely to suffer as badly from a bad spill, a puddle of vomit or a scratch in the furniture than would a newly-remodeled room with new wallpaper, furniture or carpet. If we think you're likely to be up all night and noisy, you are getting that room next to the elevator, or next to the noisy vending area. (In any event, you won't be put next to the little old lady who's stayed two or three nights already, and called at three a.m., to complain about noise on each of those nights. . .) Or if you show up late at night having just checked out another hotel because you encountered bedbugs at that fleabag property, you're not getting my most freshly renovated room. If I have a room for you at all (and if I know of your problem before you ask about a room at my hotel, the answer may very well be, no, I don't . . .), it's going to be one that I can hopefully afford to live without for a week or two if it turns out you brought any 'passengers' on your person or belongings from the other hotel, and that's what it comes to. (Not that you'll be getting that room at a bargain price, under the circumstances, if I haven't already quoted you a lower one and committed myself . . .) Or, it's going to be a room scheduled for deep cleaning very soon (see Michael Forrest Jones' answer to How do good hotels always feel so clean and fresh? ). Whatever the 'flaws' of the room we give you, it's a room we think will work better for you than any other we have. Let's say you come in with a construction crew: you've been out working all day, you're hot, dirty and you're wearing muddy boots. You're going to get a room with older carpet that's about due for replacement, where the furniture is already dinged up a bit and getting about due to be replaced as well. If you have a pet, you need to be near an entrance (or near an elevator at least) so you can walk the dog or change out the kitty litterbox, even if a slightly better quality room at the same price might be on a higher floor or down the hall. Otherwise, it's nothing personal. You just checked in at the wrong time and drew an unlucky card from the room rack. But it shouldn't have been that much worse than most of the other rooms, at least not every time . . .